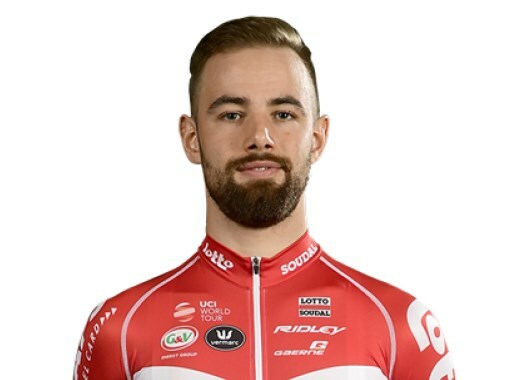 Victor Campenaerts (Lotto Soudal) set the third best time in the opening time trial of the Giro d'Italia. Being beaten by 4/100th of a second by Rohan Dennis (BMC), the rider is glad another rider took the Pink Jersey. The Belgian showed a strong performance at the first time trial of the Italian grand tour. "I think I have lost time in the second part, in the descent," said the rider at the end of the day to Belgian newspaper Het Nieuwsblad. "It was a difficult time trial, I don't think I missed any time in the corners. Maybe at that turn at 900 metres from the finish, I could have been a bit faster. But it doesn't happen often that you can take everything at 100 percent on the limit. It was the same for everyone, we have only been able to explore the entire course for the first time this morning." Though Campenaerts did a good job on the day, he is glad he didn't miss the chance of wearing the Pink Jersey by a tiny margin. "I prefer a completely flat time trial, but this course was very much in line with my abilities," he explained. "But it is no shame to be beaten by (Tom) Dumoulin and Dennis. I'm happy that Dumoulin was a little faster than Dennis so I wouldn't lose by fourth-tenths of a second. (The RCS later rectified the time to 4/100th of a second)." The rider now has his eyes set on the next objective for this race. "The next goal is the long time trial. The Pink Jersey will no longer be in reach but winning a time trial in a grand tour is the best thing after a victory in a big championship," he added. Check out our 101st Giro d'Italia Race Guide here.